You’re exhausted. You're finding it difficult to convey a complete thought. You're realizing it's only Tuesday and only 3-hours into your 9-hour shift…. and you’re totally burning yourself out! 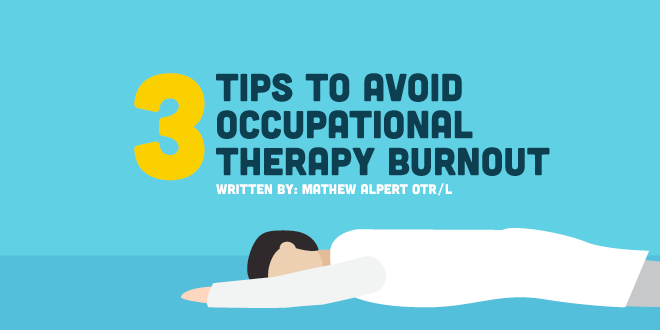 Occupational therapy burnout is real. Most clinicians experience it at some point during their careers, but we at NGOT want to help you avoid compassion fatigue when it often strikes: the beginning of your career! It's very common to experience burnout when we first start treating clients. We like to think the hard work is over, but it’s not. We now have to keep up productivity levels, write our notes, keep our clients engaged, spend time evaluating and assessing difficult diagnoses, not to mention possibly supervise other OTs, COTAs, or students. Did I mention having a social/family life, engaging in leisure activities, taking care of those lovely student loans…. Should I keep going? I didn’t think so. We all learned that occupational therapy can be applied in a variety of settings. One particular area of the profession that is applied in every placement setting is psychosocial treatment. You might wonder, “How can I do psychosocial OT on myself?” Well, look at how much of your time is occupied by your own occupations. I hope this is starting to sound like a Barth Time Construction. As new grad OTs, we never really acknowledge the transition involved with being the occupational therapist compared to being the occupational therapy student. You might want to do a Barth Time Construction on yourself to find out how much of your time is utilized working, socializing, sleeping, etc. If you notice you're spending to much time working then have a scheduled "time off" of both work and other activities. Let's admit it, we all need a break from time to time. Occupational therapy can be a little overbearing, between the notes, assessments, treatments, and even the emotional burden of working with certain populations. Keep a schedule, and take note of whether you’re sticking to your schedule or not. You will quickly realize how you’re utilizing your time at work. Think about if you’re missing your lunch break or not. Therapists will often utilize their lunch breaks to catch up on notes or perform other work related tasks besides treating patients. This can quickly lead to occupational therapy burnout. Make a point to keep your breaks free of patient related tasks. If this is an issue for you, talk to your co-workers regarding ways to improve your workflow. Being consumed by work has both a negative and a positive connotation. We want to bring our talents as occupational therapists to the table, engaging our patients and making changes in their lives. But be wary not to let ourselves to become fully consumed by our jobs if not multiple jobs. There’s a fine line between maximizing your talent and allowing your work consume you. Many of us as new grads will start off working as a per diem occupational therapist, and might even take on several per diem positions to make up a full-time schedule. This alone can consume you, as juggling competing per diem placements can start impacting your personal life outside of work.